Whenever I read through Psalm 139, I think of how much God knows about me. David’s prayer reminds me that God knows everything about me. My sitting down and my rising up, my thoughts and my words. He even knows my ways and my walk. God knows it all perfectly. 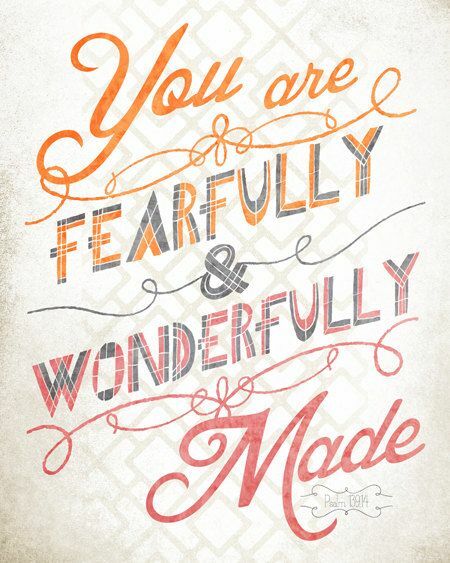 I am fearfully and wonderfully made! God knows everything about you too so be encouraged with these simple words of wisdom and praise. Psalm 139:14 (NKJV) I will praise You, for I am fearfully and wonderfully made; marvelous are Your works; and that my soul knows very well.